Sugar Balance and Cipex by Equine Science can help your insulin resistant horse by supporting normal insulin levels and increased circulation! 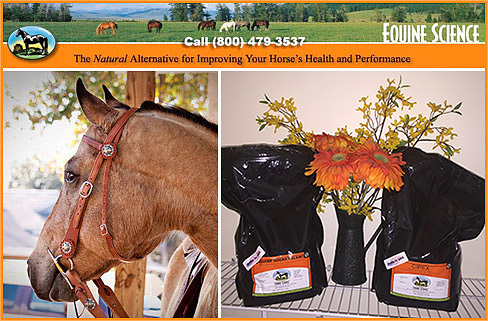 Why Use Herbs 4 Horses by Equine Science? Nature often has wonderful solutions to help with health issues. Any time you can NATURALLY improve your horse's health and performance you are always better off- and so is your horse. Many drugs like steroids or inhalers, offer temporary relief at best and long term use of steroids can literally destroy your horse's chances of recovery or health and well being. Equine Science was founded by horse people who believe that nature has the answers to health questions for all creatures great and small. Made with quality ingredients from nature's garden, Equine Science helps your horse to obtain the nutrients he needs to maintain his own natural health and immunity. Is It True That Equine Sugar Balance Can Help My Overweight, Insulin Resistant Horse? Yes! Equine Sugar Balance is an herbal blend which supports normal sugar metabolism, nourishes the glandular system, helps restore normal thyroid function. Ingredients: Fenugeek - reduce blood gluclose levels, improve gluclose tolerance. Kelp - trace minerals necessary for metabolic activity, high iodine content to support thyroid function. Burdock - very high in chromium, zinc, and magnesium needed for sugar balance and overal glandualr balance. Siberian Ginseng - balance adrenal and thyroid function, increase stamina and endurance. Dandelion - support the lover's role in blood sugar balance. Cleavers - rich source of iodine for the thyroid, excellent for overall glandular balance, good herb to cleanse the kidneys. Nettle: High in zinc for blood sugar balance, stimulates circulation, mild diuretic. Cinnamon: reduce blood sugar levels, increase natural produciton of insulin. Note: Available in 3-10 pound sizes starting at only $52 a month! Recommended Amount: scoops per day based on a 1,000 lb. horse. What If My Horses Has Foundered Or Has Laminitis and Very Sore Feet or Abscesses? is a unique blend of natural herbs that may help improve circulation to tissues, speed repair and possibly halt tissue damage-which can be very beneficial if your horse is having any kind of health issue that requires the repairing of damaged tissues. Note: Available: 3 lb., 5 lb. and 10 lbs... starting at only $48.95! What If My Horse Has Cushings? Cushings Blend is the answer! Cushings Blend is an herbal formula which helps to balance the Pituitary and Hypothalamus glands of Cushing horses. It can make a real difference to your horse! Ingredients: Burdock and Chaste Berry - Balance the pituitary and Hypothalamus glands. Kelp - Supply trace minerals and Thyroid Support. Ginseng - Balances Adrenals, and their connection to the hypothalamus and Pituitary glands. Fenugreek - Offer Blood Sugar balancing effects. Paud'arco - A Anti Tumor herb and helps build the Immune system. Rosehips - For Vitamin C needed for the Immune system and Adrenal glands. Milk Thistle - For proper Liver function-- Recommended Amount: 2 scoops per day based on a 1,000 lb horse. What If I Want To Boost My Horse's Immune System? is unique blend of natural herbs developed to provide optimal support to strengthen the immune system in horses suffering from EPM, or other serious health matter. Note: Available: 3 lb., 5 lb. and 10 lb. Recommended Amount: 2 oz. per day based upon 1,000 lb. horse. What Do Horse Owner Say About Equine Science? My beautiful 8 year old Morgan named Sugar, has always had such a zest for eating, and she was always overweight. I tried everything I could find to no avail. When Don told me about SUGAR BALANCE I was excited and yet worried that it would not work for me. Within 30 days I started to notice a difference. Her crest was much softer. Within 60 days Sugar looked wonderful. She will never be skinny, but she looks amazing. I also put Sugar on CIPEX because her feet were always so tender now she is confident without shoes and no more sore feet! I am thrilled with SUGAR BALANCE and CIPEX and recommend it to anyone with issues like mine! I cannot thank you enough for recommending Cipex for my 20 year old gelding. He foundered about 5 years ago. I have battled with abscesses in his front feet off and on for 5 years. He could barely walk and was in a lot of pain. My farrier tried special shoes but they did not help. He comes and trims his feet every 4 weeks and treats his abscesses when they come about. We have treated with antibiotic injections and several bottles of SMZ for 2-3 week periods with bute to keep him comfortable. I found him lying down 90% of the time for a month and decided it was time to put him down. I prayed to the Lord that if there was any product out there to help him to give me a sign. I was on the internet and decided to try one last time to find something and it came to me to look under herbs for horses. I cannot thank you enough for giving us a second chance with him. I have been using Cipex for 2 months and Jazz is now up walking around and I never see him lying down. I wake up in the morning and look out the window and he is waiting for his Cipex. The veterinarians did not give me much hope for him but Cipex has given this 20 year old gelding a new lease on life. I tried to catch him one day last week and he ran from me. I was so excited to see him run once again. I have had this horse for 18 years and he has saved my life more than once, now I feel it is my turn to try and save his. I will continue Cipex the rest of his life and I thank God for putting these natural herbs on earth and for the people He gave the knowledge to make these products. I just wanted to let you know Rusty (Shetland pony) with re-occurring laminitis is still doing good. He still gets laminitis (do to hay changes, weather and so on) but he is able to stay stable on Cushing's Blend. He was dx with Insulin Resistance some time ago and this is the only product that consistently helps him. I give him one scoop split between feedings. He has a new companion mini that gets him moving - he is able to do this because of you herbs. Thanks again!! I started my gelding on the SUPER IMMUNE BOOSTER on the recommendation of a local horse rescue that swears by it. Samson has been through a rough year, which included a hospitalization for pneumonia, and the diagnosis and treatment of EPM. I chose to start him on your SUPER IMMUNE BOOSTER right after I finished his conventional treatment, and I am still ama...zed at the results. He has never looked or felt better. With all the health problems he went through in the last year, I had decided to retire him, but after a month or two of being on your supplement, I am starting to reconsider! He has been galloping and playing in the field, has put the last few pounds on that we were struggling to maintain, and has so much life compared to the depressed-looking guy he used to be. I have never been a huge believer in herbal products, but this experience has really forced me to reconsider. I can't thank you enough, and look forward to many more orders with you! Where Can I Buy Equine Science Products? Our DEALERS actually offer LOWER PRICING than our direct website (which is herbs4horses.com). This is to encourage horse owners to support the good people who provide horse owners with the Equine Science line of products. If you have any problem locating a "dealer" just give us a call and we are happy to help you. Call us today!